Whichever way you look at it, alcoholism and poverty are linked. There are some studies that find alcoholism causes poverty and others that find poverty causes alcoholism, but the correlation is clear, even if the cause and effect is not. Simply put, it’s extremely expensive to sustain an expensive addiction for an extended period of time. 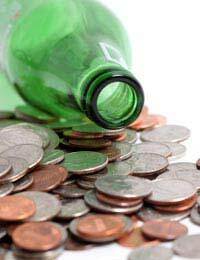 Alcoholism is not as expensive as some other addictions but even so, it can be remarkably easy to fall below the poverty line. The three basic needs of humanity: food, shelter, clothing, can all be put under pressure by the need to drink and the cost of alcohol – it’s not uncommon for alcoholics to start spending the rent or mortgage money on booze and for housing security for themselves and families to be put at risk. Debt is a natural consequence of problem drinking. not only does it start to consume the household budget, it can lead to other addictions and associated behaviours such as gambling, smoking and consumption of drugs. extreme alcohol abuse leads to the break-up of families so there is even less financial security – homes may be repossessed and cars and furniture taken, to cover alcohol induced debts. Education about alcoholism is the best way to move from addiction to recovery. It’s not just the alcoholic who needs to learn new ways: their family and friends need to understand why they should not lend money to the alcoholic, even after recovery. Many alcoholics will have lost a great deal, financially and emotionally, through their disease. The AA steps suggest they should start by being thankful for food, shelter and clothing, and take one day at a time – these two processes are designed to help the alcoholic appreciate whatever he or she does have and to live each day thoroughly and well, without considering the future or the past. This works for a while but modern life does not easily allow people to live one day at a time! Clear financial planning is important – all decisions about money need to be made with full understanding of the situation (the alcoholic may have large debts to clear, for example) and with honesty about how long it will take to be financially independent again. Many alcoholics worry about their ability to manage money and it can be a good idea for them to take financial planning courses, either working through the local education authority, through AA or other rehabilitation organisations, or by asking a finance professional to give them ‘financial coaching’ to allow them to make mature, informed decisions about money. Detachment is vital – it can be very difficult for those who have suffered poverty through somebody else’s drinking to let go of financial control, but the alcoholic will not recover until they take responsibility for all their actions, including financial ones. This means that separate bank accounts, credit cards and saving schemes may be the only answer to the situation, at least until financial trust can be re-established over time. The issue of finance and the effects of poverty can be long-lasting and rebuilding relationships can be intense and painful. Counselling may be necessary for family members as well as the alcoholic: it is a good idea to work through these issues with the help of a professional as the strong emotional effects of financial insecurity and poverty can be difficult for the family to explore and opening up old wounds and painful experiences may also trigger the desire to drink again in the alcoholic!